This work is an investigation on the microvasculature of the cutaneous infiltrates of leprosy witli the immunohistochemical staining of endothelial cells in cutaneous biopsies. Anti-Factor Vlll-related antigen antibody (anti-FVIII-ra) and Ulex Europaeus-1 lectin (UFA-1) binding were utilized as endothelial cell markers. Thirtynine patients grouped according to the Ridley-Jopling classification (14 borderline tuberculoid, 18 borderline lepromatous, 6 lepromatous, and 1 indeterminate leprosy) were selected for this study. Two microvascular architectural patterns could be clearly distinguished: lepromatous lesions presented a dense and tortuous mesh of microvessels among the Mycobacterium leprae-glutted macrophages; whereas the microvessels in the tuberculoid lesions were restricted to the periphery of the granulomas and were not seen among the central epithelioid cells. We were able to distinguish three basic morphological kinds of infiltrate distribution related to the microvessels: micronodules, cords and macronodules. Intensifications of the FVIII-ra immunoreactivity and UEA-1 binding capacity were observed in the endothelial cells of microvessels involved by the inflammatory infiltrate. A distinct cytokine expression profile at the leprosy poles and the role of mast cells in angiogenesis were speculated as factors contributing to these distinct patterns. Growth of the lesion and systemic dissemination of M. leprae in the bipolar spectrum of leprosy may hypothetically be influenced by the vascular-infiltrate relationship. The detection of angiogenesis in the cutaneous lesions of leprosy may bring about alternate and/or additional strategies for leprosy treatment. Ce travail examine, à partir de biopies cutanées, la microvasculature présente an sein d'inliltrats de lèpre au moyen du marquage immuno-histochimique îles cellules endothéliales. Des anticorps anti-antigènes liés au facteur VIII (anti-FVIIIra) et al lecrine numéro 1 dérivée de Ulex Europaeus (EUA-I) furent utilisés comme marqueurs des cellules endothéliales. Trenteneuf patients, groupés selon la classification de Ridley et Jopling (14 tuberculoïdes borderlines, 18 lépromateux borderlines, 6 lépromateux et une lèpre indéterminée), furent sélectionnés pour cette étude. Deux aspects architecturaux d'arrangement de la microvasculature, clairement séparés, furent identifiés: les lésions lépromateuses montraient un lacis dense et tortueux parmis les macrophages gorgés de Mycobacterium leprue, en revanche, la microvasculature des lésions tuberculoïdes était limitée à le périphérie des granulomes et absente de la zone central composée de cellules épithélioïdes. Nous avons pu distinger, basé sur les microvaisseaux. toris formes morphologiques principales de distribution des infiltrats: des micronodules, des cordons et des macronodules. L'immuno-réactivité de FVIlIra et al capacité de UEA-1 à sc lier aux cellules endothéliales étaient plus intenses lorsque ces dernières formaient I a microvasculature des infiltrais inflammatoires. Les profils très distincts d'expression de cytokines, présents aux pôles du spectre d'expression de la lèpre, ainsi que le rôle des mastocytes dans l'angiogenèse, lurent évoqués comme facteurs possibles contribuant à la présence de ces microvasculatures d'aspect très différent. La croissance de la lésion et la dissémination hématogène de M. leprae en rapport avec le spectre bipolaire de la lèpre pourraient être influencées par la relation vaisseaux-infiltrat. La détection d'angiogenèse dans les lésions cutanées de lèpre pourrait suggérer des stratégies alternes et/ou additionnelles pour le traitement de la lèpre. En este trabajo se hace una investigation sobre la microvasculatura de las lesiones cutâneas de la lepra, utilizando tinciones histoqiiímicas para células endoteliales. Se utilizo un anticuerpo contra cl antígeno relacionado con cl factor VIII (anti-FVIlIra) y la lectina de Ulex Europaeiis-I (UEA-I ). Dentro de los 39 pacientes incluídos en cl estúdio estuvieron 14 tubereuloides subpolares, 18 leproniatosos subpolares, 6 lepromatosos, y I indeterminado (clasilicación de Ridley y Jopling). Sc ohservaron dos patrones vasculares perfectamente distinguibles: las lesiones lepromatosas presentaron una densa y tortuosa red de vasos microscópicos entre los macrófagos saturados de bacilos mientras que en las lésions tuberucloides la mierofasculatura estuvo restringida a la periferia de los granulomas y no se observo entre las células epitelioides centrales. También pudimos distinguir très tipos básicos de distribución de los infiltrados en las lesiones: micronódulos, cordones y macronódulos. La reactividad más intensa con anti-FVIIIra y con EUA-1, se observo en las células endoteliales de los vasos afectados por cl infiltrado inflamatório. Se propone que los distintos patrones de inliltración y angiogenesis obedeceu a la diferente expresión de citocinas y a la diferente participación de las células cebadas en cada forma polar de la lepra. Hl crecimiento de la lésion y la diseminación sistémica de M. leprae en cl espectro bipolar de la lepra podríaii, hipotéticaniente, verse inlluenciados por la relación entre la microvasculatura y cl infiltrado. La detección de angiogénesis en las lesiones cutâneas de la lepra podría llevar a nuevas estratégias para cl tratamiento de la enfermedad. Leprosy is an infectious disease which presents a chronic inflammatory infiltrate affecting predominantly the skin, the mucosa of the upper respiratory tract (nasal cavity, larynx) and the peripheral nerves (7). The leprosy infiltrate can present either as an epithelioid granuloma in tuberculoid lesions or as an accumulation of Mycobacterium leprae-loaded macrophages in lepromatous infiltrates (7). The inflammatory response is intimately concerned with microvasculature. An increase in vascular permeability mediated by vasomotor reflexes contributes to the initial inflammatory exudation and leukocyte migration out of the microvessels (9). In a second step, angiogenesis mediated by migration and proliferation of endothelial cells into a remodeled matrix provides the nutritional support for the evolving process (10). Epithelioid granulomas are classically considered avascular structures, and the mechanisms of vessel growth inhibition in this special type of inflammatory infiltrate remains unknown (13). Reports found in the literature on vascular alterations in leprosy focus on the loading of endothelial cells by M. leprae, on the mural vascular lesions by the granulomatous infiltrate (3, 8, 12) and on some ultrastructural changes of the cutaneous microvessels which are not specific to leprosy (4, 5). All of these morphological findings were correlated with the anatomic and clinical presentation of the disease. Boddingius (6) also detected alteration of the bloodnerve barrier permeability in experimental mouse leprosy neuropathy. Multiple functions are attributed to the vascular endothelial cells. They form a multifunctional interface between circulating blood and various tissues and organs of the body. They constitute a selective barrier for macromolecules, as well as a surface that actively maintains the fluidity of blood through the antithrombotic and fibrinolytic mechanisms (9, 14). It is also a metabolically active tissue, serving as the source of multiple factors (peptides, proteins, lipids) that are critical for normal homeostasis. These include growth stimulators or inhibitors, e.g., platelet-derived growth factor (PDGF), transforming growth factor-β (TGF-P), fibroblast growth factor (FGF) and heparinlike glycosaminoglycans, vasoconstrictors (endothelin) and vasodilators (nitric oxide) (14). The migration of leukocytes is also regulated by vascular endothelial cells which can express adhesion molecules, facilitating leukocyte adhesion to the vessel wall and subsequent migration to the extravascular compartment (21). Since leprosy expresses a bipolar spectrum of clinical and pathological features in which the cellular and matrical components are distinct (1), the present study addressed the cutaneous microvessels in leprosy lesions, aiming to describe the distinct patterns of the microvasculature and their topographical relationships with the inflammatory infiltrate. Distinct patterns of microvasculature were observed in the tuberculoid and in the lepromatous infiltrates. These distinct vascular architectures have, in a speculative way, biological implications for the growth of the lesions as well as for the survival and dissemination of M. leprae. Thirty-nine biopsies (one from each patient) were collected in the Souza Araujo Ambulatory, Laboratory of Leprosy, Oswaldo Cruz Foundation, Rio de Janeiro, Brazil. The patients were grouped according to the Ridley-Jopling classification (25) with the following distribution: 1 tuberculoid (TT), 14 borderline tuberculoid (BT), 18 borderline lepromatous (BL), 6 lepromatous (LL), and 1 indeterminate (1) leprosy. The biopsies were cleaved in half. One half was embedded in paraffin and the sections were stained with hematoxylin and eosin (H&E) and Wade staining. The other half was snap-frozen in liquid nitrogen, cut in a cryostat (C. T. Harris, North Billerica, Massachusetts, U.S.A.) and dried overnight at 37°C. The sections were fixed in acetone at 4°C for 20 min and air-dried for 5 min (28). The sections underwent peroxidase-antiperoxidase immunohistochemical staining (29) with monoclonal anti-human Factor VIII-related antigen (FVIII-ra) (Dako, Copenhagen, Denmark) (1:100 diluted in Tris-buffered-saline) (33). Fluoresceinated Ulex Europaeus (UEA-1-FITC) (L-9006; Sigma Chemical Co., St. Louis, Missouri, U.S.A.) (1:50 diluted in 1% albumin) was utilized for direct fluorescence staining (19). Brightfield and fluorescence microscopies were performed in a fluorescence microscope (Zeiss, Oberkocken, Germany). Ulex Europaeus (UE) is a lectin which binds on fucosil residues of oligosaccharides present on the membrane glycoproteins of endothelial cells, and is also used as a universal endothelial marker (l9). FVIII-ra is expressed in normal endothelial cells, particularly within capillaries and venules (19). Anti-FVIII-ra immunoreactivity and UEA-1-FITC binding on endothelial cells allowed the visualization of changes in the dermal microvascular architecture due to the leprosy inflammatory infiltrate, revealing three distinct patterns: micronodular, cordonal and macronodular (Figs. 1A and B; 2A and B; 3A and B). These patterns were topographically related to the dermal vasculature showing focal distribution in the incipient or indeterminate stage (micronodular) and cordonal or confluent aspects (macronodular) in the more-developed lesions. The initial focal infiltrate was either located in the upper or reticular dermis or in the deeper dermal regions (Fig. 1A and B). Fig. 1. 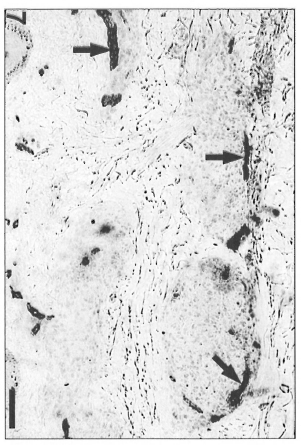 A = Micronodular inflammatory infiltrate (arrows) surrounding the dermal microvessels in indeterminate leprosy (Gomori's reticulin; Scale bar: 100 µm). B = Schematic representation of the micronodular pattern. Fig. 2. A = Cords of inflammatory infiltrate (arrows) adjacent to vessels, showing coalescence in the upper dermis and drawing the candelabra disposition of dermal vessels in a BT patient (Gomori's reticulin; Scale bar: 500 µm). B = Schematic representation of the cordonal pattern. Fig. 3. A = Macronodular lesion occupying the majority of the dermal area in an LL patient biopsy. Complete alteration of microvascular architecture was found and vessels neoformation certainly occurred (Gomori's reticulin; Scale bar: 100 µm). B = Schematic representation of the vessels in macronodular lesions. In BT and BL lesions, the inflammatory infiltrates formed sheaths encircling the vessels (cordonal pattern; Fig. 2A and B) and tended to coalesce, evolving to a macronodular infiltrate in the lepromatous lesions (Fig. 3A and B). Indeterminate patterns of confluent lesions were also found. In the epithelioid granulomas of BT lesions, the microvessels were predominantly distributed in the peripheral region of the cellular infiltrate (Fig. 4A and B) close to septa of uninvolved dermis. Fig. 4. A = Epithelioid granuloma with FVIII-rapositivc vessels (arrows) occupying a peripheral position in relation to the central epithelioid cells of a BT lesion. Note that the central region has no positive vessels (avidin-biotin peroxidase; Scale bar: 40 µm). B = Epithelioid granuloma (EG) with UE-positive vessels (arrows) in the periphery of a BT lesion epithelioid granuloma (UE lectin staining; Scale bar: 100 µm). On the other hand, polar lepromatous lesions (LL) presented a mesh of microvessels among the M. leprae-glutted macrophages (Fig. 5 A and B). Most of the vessels in tuberculoid and lepromatous lesions did not display elastic fibers in the walls (Fig. 6Aand B). Deeper dermal vessels exhibited an enhanced FVIII-immunoreactivity (Fig. 7) and Ulex Europaeus-affinity when involved by the inflammatory process. UE also bound to the follicular and epidermal keratinocytes. Fig. 5. Lepromatous lesion with numerous FVII1ra-positive vessels among macrophages without predominant peripheral distribution in relation to the infiltrate (avidin-biotin peroxidase; Scale bar: 100 µm). B = Lepromatous lesion with numerous UE-positive vessels and no predominant peripheral distribution in relation to the infiltrate (UE lectin staining; Scale bar: 100 µm). Fig. 6. A = Epithelioid granulomas with absence of elastic libers in a BT lesion. Internal lamina clastica of a muscular artery (arrow) was used as a positive control of the resorcin-fuchsin staining (Scale bar: 80 µm). B = Lepromatous lesion with absence of elastic fibers (resorcin-fuchsin staining; scale bar: 80 µm). Fig. 7. Enhanced FVIII-ra-positivity of microvessels (arrows) in periphery of epithelioid granulomas in a BT lesion (avidin-biotin peroxidase; Scale bar: 80 µm). This pattern was present in TT, in BT and in BL infiltrates. This work is a morphological study on the microvasculature involvement in the cutaneous lesions of leprosy. The anatomical interrelationship between the microvessels and the inflammatory infiltrate of leprosy was evidenced by the immunohistochemical staining of the endothelial cells. The leprosy infiltrates were found to be topographically related to the microvessels since their early stages. This relationship influences the outlines of the lesions. The micronodular and cordonal patterns topographically correspond to the candelabra anatomical disposition of dermal vessels (26). However, in the macronodular lepromatous lesions there is distortion of normal dermal microvascular architecture. The tortuous and dense presentation of the microvessels among macrophages in the lepromatous lesions suggests the local occurrence of vascular neoformation. On the other hand, the absence of any vessel among the central epithelioid cells of the tuberculoid granulomas indicates an epithelioid cell-mediated displacement or inhibition of vascular proliferation. According to our results, epithelioid cells occupying the central region of leprosy granulomas are distant from the peripherally placed microvessels. Therefore, the expansion of tuberculoid granulomas could be hindered by the nutritional and oxygen demands that may result from this growth. This probably occurs in granulomas of tuberculosis, resulting in necrosis (20). However, ischemic necrosis is hardly seen in the granulomas of leprosy. The consequences of these distinct microvascular patterns are that lepromatous lesions, with their higher blood supply may grow to large confluent nodular structures supported by newly assembled matrix (1). Macrophage accumulation in these lesions is then allowed beyond the restricted limits of the epithelioid granulomas. Therefore, M. leprae is endowed with the expansion of a macrophage population which can be utilized for its intracellular growth. Hematogenous dissemination of bacilli is also facilitated due to the increased number of blood vessels near the M. leprae-glutted macro-phages. Tuberculoid granulomas, in turn, in addition to exhibiting cells adverse to intracellular mycobacterial growth (epithelioid cells) display a self-limited expansion (they never grow into nodular patterns) because of limited blood supply. The different patterns of microvasculature in tuberculoid and lepromatous lesions might be explained, in a speculative way, by the distinct cytokine profile expression in each type of lesion (2) and/or by the variation in the number of mast cells across the leprosy spectrum (11-24) since these cells are normally involved in angiogenic processes (22). Leprosy polar granulomas with their distinct microvascular patterns could be utilized as a tool for the study of the inhibition or enhancement of angiogenesis in inflammation. Furthermore, investigation of the pathogenesis of the leprosy inflammatory process should take into account not only its constituting leukocytic population, but also the epithelial, matrical and vascular components which also participate in its pathogenic mechanisms. Therefore, a detailed study of angiogenesis in cutaneous leprosy lesions can contribute to the understanding of the biology of this host-parasite relationship and may bring alternative and/or additional strategies for leprosy treatment. 1. Antunes, S. L. G., Gallo, M. H. G., Almeida, S. M. R., Moita, E. M., Pelajo, M. and Lenzi, H. L. The extracellular matrix in the leprosy cutaneous lesions. Int. J. Lepr. 67 (1999) 24-35. 2. Arnold:, J., Gerdes, J. and Flad, H.-D. Immunohistologic assessment of cytokine production of infiltrating cells in various forms of leprosy. Am. J. Pathol. 137 (1990) 749-753. 3. Bernard. J. C. Estudio anatomopatologico de las lesiones vasculares del lepromatoso. Leprologia 18(1973)239-267. 4. Boddingius, J. Ultrastructural changes in blood vessels of peripheral nerves in leprous neuropathy. I. Tuberculoid and borderline tuberculoid leprosy. Acta Neuropathol. (Berl.) 35(1976) 159-181. 5. Boddingius, J. Ultrastructural changes in blood vessels of peripheral nerves in leprous neuropathy. II. Borderline, borderline-lepromatous and lepromatous patients. Acta Neuropathol. (Berl.) 40 (1977) 21-39. 6. Boddingius, J. Ultrastructural and histophysiological studies on the blood-nerve barrier and perineurial barrier in leprosy neuropathy. Acta Neuropathol. (Berl.). 64 ( 1984) 282-296. 7. Bryceson, A. and Pfaltzgraff, R. E. Clinical pathology. In: Leprosy. 3rd edn. Edinburgh: Churchill Livingstone, 1990, pp. 11-24. 8. Coruh, G. and McDougall, C. Untreated lepromatous leprosy: histopathological findings in cutaneous blood vessels. Int. J. Lepr. 47 (1979) 500-511. 9. Cotran, R. S. New roles for the endothelium in inflammation and immunity. Am. J. Pathol. 129 (1989) 407-413. 10. Cotran, R. S., Kumar, V., Robbins, S. L. and Schoen, F. J. Inflammmation and repair: In: Pathological Basis of Disease. Philadelphia: WB Saunders Company, 1994. 11. Cree, I. A., Coghill, G. and Beck, J. S. Mast cells in leprosy skin lesions. J. Clin. Pathol. 43 (1990) 196-200. 12. Fite, G. L. The vascular lesions of leprosy. Int. J. Lepr. 9(1941) 193-202. 13. Folkman, J. and Klagsburn, M. Angiogenic factors. Science 235 ( 1987) 442-447. 14. Gimbrone, M. A., Resnick, N„ Nagel, T., Khachigian, L. M, Collins, T. and Topper, J. N. Hemodynamics, endothelial gene expression, and atherogenesis. Ann. N.Y. Acad. Sci. 811 (1997) 1-10. 15. Gordon, J. F. and Galli, S. J. Mast cells as a source of both preformed and immunologically inducible TNF-alpha/cachectin. Nature 346 (1990) 274-276. 16. Hadar, E. J., Ershler, W. B„ Kreisle, R. A., Ho, S.-P., Volk, M. J. and Klopp, R. G. Lymphocyteinduced angiogenesis factor is produced by L3T4 murine T lymphocytes, and its production declines with age. Cancer Immunol. Immunother. 26 (1988)31-34. 17. Hudlicka, O. and Tyler, K. R. Growth of vessels under pathological conditions. In: Angiogenesis. Hudlicka, O. and Tyler, K. R., eds. London: Academic Press Inc., 1986, pp. 115-149. 18. Kaminski, M. and Auerbarch, R. Angiogenesis induction by CD4 positive lymphocytes (42757). Proc. Soc. Exp. Biol. Med. 188 (1988) 440-443. 19. Little, D. Said, J. W. Siegel, R. J., Fealy, M. and Fishbein, M. C. Endothelial cell markers in vascular neoplasms: an immunohistochemical study comparing FVIII-related antigen, blood group specific antigens, 6-keto-PGFIalpha, and Ulex europaeus-1 lectin. J. Pathol. 139 (1986) 89-95. 20. Lucas, S. B. Histopathology of leprosy and tuberculosis: an overview: Br. Med. Bull. 44 (1988) 584-599. 21. Mantovani, A., Bussolino, F. and Introna, M. Cytokine regulation of endothelial cell function: from molecular level to the bedside. Immunol. Today 18(1997)231-239. 22. Metcalfe, D. D., Baram, D. and Mekori, Y. A. Mast cells. Physiol. Rev. 77 (1997) 1033-1079. 23. Moses, M. A., Sudhalter. J. and Langer, R. Identification of an inhibitor of neovascularization from cartilage. Science 248 (1990) 1408-1410. 24. Rav, S. D. Pratap, V. K„ Siiarma, N. K. and Dayal, S. S. Mast cell in leprosy. Indian J. Lepr. 62(1990)467-472. 25. Ridley, D. S. and Jopling, W. H. Classification of leprosy according to immunity; a five-group system. Int. J. Lepr. 34 (1966) 255-273. 26. Ryan, T. J. Factors determining the clinical picture. In: Microvascular Injury, Vasculitis, Stasis and Ischemia. London: W. B. Sanders Company, 1976, pp. 24-50. 27. Seabra Santos, H. and De Matos Beja, J. L. C. Histopatologia dos vasos cutaneos na lepra. Rovisco Pais 8 (1969) 3-7. 28. Taylor, C. R. Approach to the unknown primary anaplastic tumor. In: lmmunomicroscopy: A Diagnostic Tool for ilie Surgical Pathologist. Philadelphia: W. B. Saunders Company, 1986, pp. 303-326; p. 452. 29. Taylor, C. R. Fixation, processing, special applications. In: lmmunomicroscopy: A Diagnostic Tool for the Surgical Pathologist. Philadelphia: W. B. Saunders Company, 1986, pp. 43-69. 30. Taylor, C. R. Theoretical and practical aspects of the different immunoperoxidase techniques. In: lmmunomicroscopy: A Diagnostic Tool Jbr the Surgical Pathologist. Philadelphia: W. B. Saunders Company, 1986, pp. 23-42. 31. Tharp, M. D. The interaction between mast cells and endothelial cells. J. Invest. Dermatol. 93 (1989)I07S-I12S. 32. Turkel, S. B„ van Hale. H. M. and Rha, T. H. Ultrastructure of the dermal microvasculature in leprosy. Int. J. Lepr. 50 (1982) 164-171. 33. Turner, R. R.. Beckstead, J. H„ Waknkh, R. A. and Wood, G. S. Endothelial cell phenotypic diversity. Am. J. Clin. Pathol. 87 (1988) 569-575. 34. Yamamura, M., Uyemura, K., Deans, R. J., Weinberg, K„ Rea, T. H„ Bloom, B. R. and Moulin, R. L. Defining protective responses to infectious pathogens: cytokine profiles in leprosy lesions. Science 254 (1991) 279-281. 2. M.S. ; Department of Pathology; Oswaldo Cruz Institute, Oswaldo Cruz Foundation, Rio de Janeiro, RJ, Brazil. 3. M.D., Ph.D., Department of Pathology; Oswaldo Cruz Institute, Oswaldo Cruz Foundation, Rio de Janeiro, RJ, Brazil. 4. M.D. ; Department of Tropical Medicine, Laboratory of Leprosy, Oswaldo Cruz Institute, Oswaldo Cruz Foundation, Rio de Janeiro, RJ, Brazil. Received for publication on 11 December 1997. Accepted lor publication in revised form on 28 April 2000.